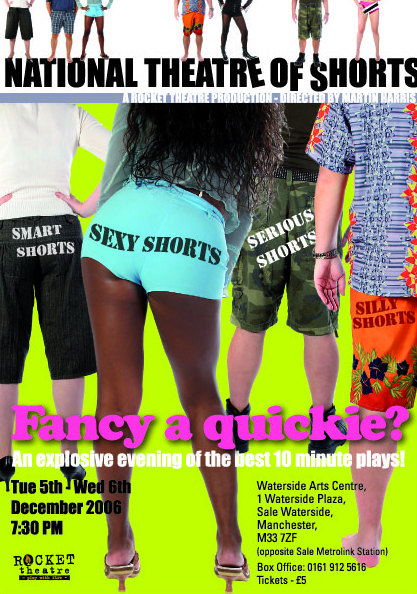 National Theatre of Shorts Poster. Extracts of short 10 minute plays were performed as a pilot of a possible long term project for Rocket Theatre in the future. This production was performed by members of the adult acting classes. Carrolly Oldham, Claire Barton, Darren Scott, Daryl Dewhurst, Emma Sanders, John Stanway, Laura Berry, Laura Drummond, Marlene Critchlow, Micky Dacks, Mike Friend, Nicola Bailey, Noel Vernon, Sarah Catling, Shirley Diver, Sue Caudle, Tahira Dar, Vanessa Kanoui. 5 & 6 December 2006 / Waterside Arts Centre, Sale, Manchester.